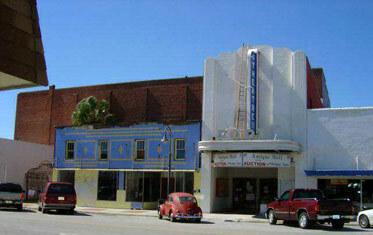 PORT ST. JOE, FL — Recently, I clearly saw the value of Historic Registry status for our Port Theatre. The process of application for National Historic Registry nomination is not a quick process. It could take 2 to 3 years to get through successfully. One needs to persevere and not get discouraged because in the long run it helps preserve one more theater, one more treasure. Contacting your state’s historic department is probably the best first step in the process. You may also want to visit the National Register of Historic Places website. During the process, I felt like I was back in school again with an unhappy English teacher, and the State site specialist assigned to our building was, at times, a pain in the painstaking process. More than once I wanted to give up. It was time consuming, frustrating, cost money that was hard to come by (for professional photographs to meet their standards, etc), and although I enjoyed the researching process, it seemed to never end. It was enlightening to realize the many varied uses of our building over time. During times of war or crisis, our theater was used as a rallying place for the public to come together and accomplish goals. The brick and steel structure served as a center for high school bands, red cross drives, talent shows, Christmas gift sharing with the poor of our community, was a source of war news, a place to sell US (war) bonds, it was a bingo hall, a political headquarters, and much more. I dug around through the archive editions of our local newspaper with my digital camera and spent days reading and looking for any reference to the Port Theatre. It was fantastic to read all that I found! In the process of our restorative efforts, we have spoken with many people inside our building who have shared many stories of being in and enjoying the Port Theatre. Stories as varied as a German soldier who snuck off his submarine out in the Gulf and attended a movie during the war, a couple who met in this building and later married, some 50 odd years ago, and many human interest stories over a broad range of topics. Yesterday I called our site specialist up and told him he was my hero. It’s been nearly a year since we obtained Historic Registry status for the Port Theatre. In the last year, a neighboring property has been preparing and planning an addition to their building that would negate an old 1940’s Party Wall agreement (The theater originally gave the owner of land beside it to build a building using part of the Theatre’s wall up one story only). The local officials have been considering the proposal to come up a second story, which would block the windows of our manager’s apartment, where we live, somewhat, and change our view. The State of Florida issued a letter to the City of Port St. Joe that discusses the negative impact this addition would have on the historic treasure within the community. The letter was priceless, and gave me great joy. It is probably only the beginning of the positive effects that we will see over time. Listing on the National Registry does not guarantee safety and protection, but it assists. There’s alot to research in the process. Things like accepting federal funds in restoration will limit you alot in future choices, and give them more authority over the Historical building. Demolition is less likely with the status, though properties are not completely insulated from the prospect of demolition just because they have historic status. There are many possible tax benefits. Interesting to note that it was a county commissioner making a statement about tearing down our marquee on the local news channel that pushed me into taking the time and making the effort. For a long time, I felt like I was running a race in the jungle, with no finish line in sight. I also wondered if when I got to the finish line, would it be worth the effort? The ONE letter from the State of Florida regarding the future of a neighboring building, in my opinion, made it all worth it. I just wanted to share my heart and perhaps encourage others to consider applying for and obtaining historic status for their theaters. The experience of the PORT THEATRE in its quest for listing on the National Register of Historic Places brought back to mind my own efforts over a year’s time in doing the research and writing of the application for National Historic Landmark designation for the PABST THEATER in Milwaukee back in 1990-91. True, it is by no means an easy task, but it is well worth it! The major criterion for National Registry listing is to prove historic significance to the area of the theatre. The major criterion for NATIONAL LANDMARK listing is to prove significance to the nation as a whole, as well as state and local significance. Yes, one often does start with his state historic sites officer, as detailed on the web site of the National Park Service which administers both programs. If one cannot get local and state backing, it is usually impossible to convince the feds of any real import of a theater; merely being old is not enough.